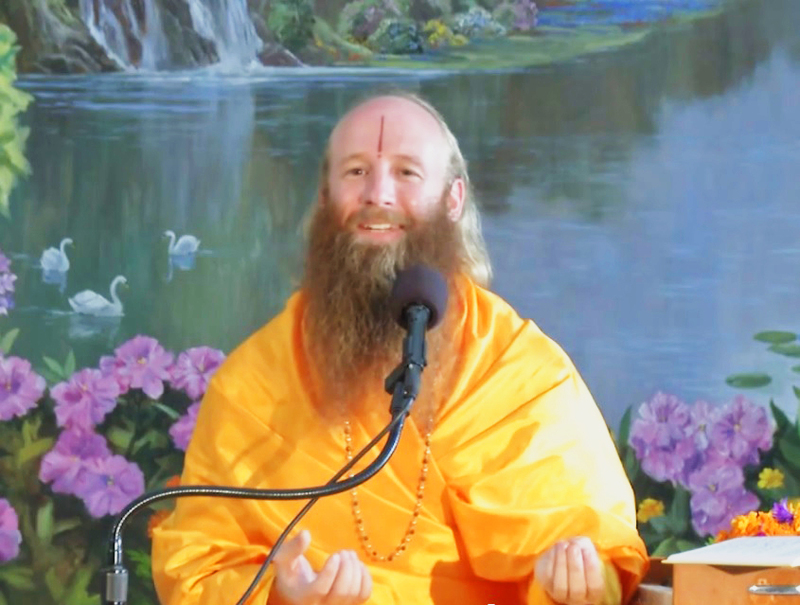 Swami Nikhilanand is a Canadian born Hindu spiritual leader based in Austin, Texas. He is a sanyasi disciple and pracharak of Jagadguru Shree Kripaluji Maharaj. Attracted to the teachings of Hinduism from a young age, Swami Nikhilanand eventually let his deep spiritual longing lead him to India, where he was most fortunate to come under the guidance of Shree Kripaluji Maharaj. Thereafter, living in the ashrams of JKP, he extensively studied Hindi, the philosophy of the prime Sanskrit scriptures (Vedas, Darshan Shastras, Gita, Bhagwatam), and practiced meditation in the tradition of raganuga bhakti. In 2003, he was given sanyas. Now, with the blessings of his Guruji, he offers satsang programs throughout America, engaging audiences with his clear explanations of Hindu philosophy coupled with inspired chanting of Sanskrit mantras and shlokas and charming nam sankirtan. His informative and compelling speeches provide practical insight into how to adopt the teachings of Sanatan Dharm into our daily lives, and inspire us to awaken our inner spiritual potential. To stay in touch with Swami Nikhilanand, you can like Swami Nikhilanand ji’s facebook page or follow him on twitter.